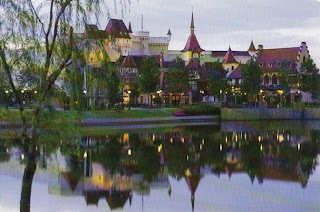 World Showcase originally sheltered nine pavilions, bulging with dining and shopping opportunities, Worldkey Information Satellites, FriendShips lagoon ferries, and an internal bus system. 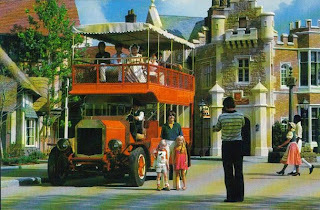 Today, through the recorded history of EPCOT Center’s first postcards, we’ll take a tour of World Showcase. Let’s go ahead and board our Lagoon Bus and begin. GLOBAL FRIENDSHIP Guests pose by one of the Lagoon Busses which travel World Showcase in Epcot Center. In the upper deck, representatives from around the world share their customs and traditions in the world’s first permanent international exposition. 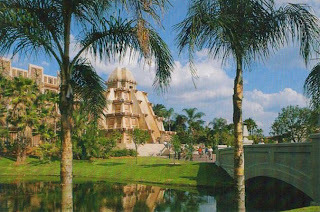 MEXICO, WORLD SHOWCASE Within the “ancient” pyramid, sail the “River of Time,” enjoy traditional entertainment and cuisine, and shop for handcrafts on the Plaza. 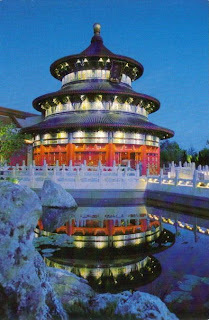 CHINA, WORLD SHOWCASE Inside the “Temple of Heaven,” behold Wonders of China that surrounds you through the movie magic of Circle-Vision 360. GERMANY, WORLD SHOWCASE The calm waters of World Showcase Lagoon creates a mirror image of Germany at Epcot Center. Inside the pavilion, a re-creation of a traditional German Biergarten celebrates Oktoberfest all year long! 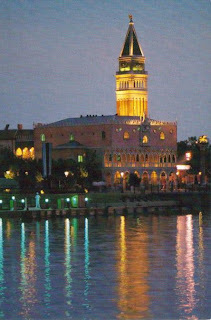 ITALY, WORLD SHOWCASE Amid Renaissance splendour, feast on Italian cuisine, shop for Venetian crystal and enjoy the Commedia dell’ Arte troupe. 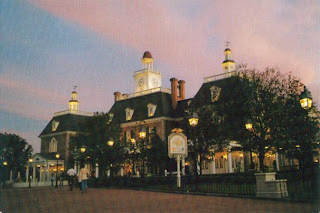 AMERICAN ADVENTURE A cast of 35 Audio-Animatronics figures, giant-screen movies, and the magic of a Broadway show bring to life a dramatic story of America and its people. 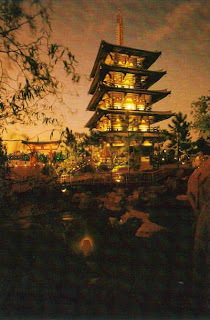 JAPAN, WORLD SHOWCASE A pagoda rises among the sculpted gardens and colorful koi fish ponds. Shop in a store dating from the 17th century and try teppanyaki dining in a setting recalling the Shishinden Shrine. 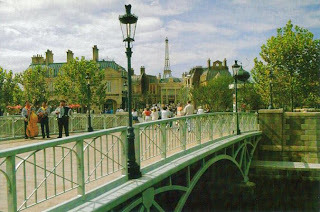 FRANCE, WORLD SHOWCASE Boulevard shops feature wines, perfumes and artwork. Renowned chefs host an elegant restaurant, and a new romantic movie takes you on a soaring tour. 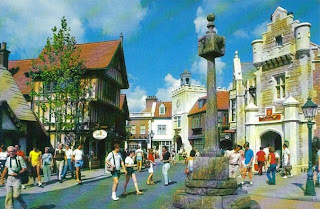 UNITED KINGDOM, WORLD SHOWCASE Sup on British fare and raise a pint of ale at the pub. Stroll cobblestone lanes and see eight different architectural styles. Linger in quaint shops packed with British goods. 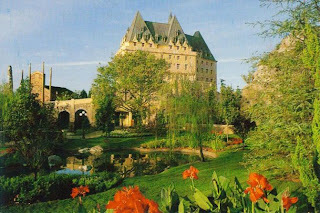 CANADA, WORLD SHOWCASE Surround yourself with Canada at a new Circle-Vision 360 movie, shop for Eskimo crafts at a trading post, stroll through “Victoria Gardens” and dine in a wine cellar. What an enjoyable tour - and such comfortable seats on the Lagoon Bus too!